Miyun is Beijing’s Garden of Eden, and its thick forests cover a little over 60% of the area. 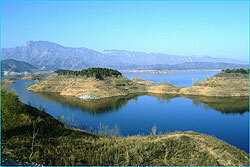 The Miyun Reservoir is surrounded by mountains and offers sparking blue water sources, cool fresh air and verdant lands. Since the turn of the century, Miyun has rapidly expanded its tourist trade. In the years to come, Miyun’s natural landscape will increasingly be covered with income-generating leisure resorts.